When the Nintendo 64 hit the market and suggested that 2D games had gone the way of the dodo, many of us that were fond of fancy sprite-work were forced to dust off elderly hardware to scratch our itch for the classic genres we held dear — until the Game Boy Advance came along, that is. Often reflected upon as the second coming of the Super Nintendo, the 32-bit GBA produced many games that felt like, or were, sequels to beloved classics from the 16-bit era. With that in mind, in comes Mario Kart: Super Circuit, which is essentially a sequel to Super Mario Kart. Fundamentally, Super Circuit is the same experience as Super Mario Kart: race three to five laps through flat circuit-style courses, collect coins and items, and do whatever you can to finish in first place and earn gold trophies. Outside of the vehicle handling being slightly sensitive and requiring a bit more finesse to master, along with a greater environmental diversity, Super Circuit really does feel like a sequel to its Super Nintendo predecessor. So that means if you don’t regard the SNES classic very highly, you shouldn't expect to be swayed by what’s brought to the table here. 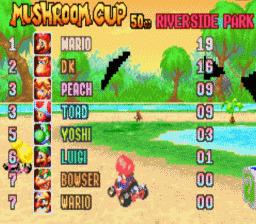 The character roster is conservative compared to modern Mario Karts, offering a selection of eight familiar faces to choose from. They are: Mario, Luigi, Peach, Toad, Yoshi, DK, Wario and Bowser. While some characters are more approachable than others when it comes to vehicle handling, it should be known that Super Circuit probably has the steepest learning curve of any game in the series. Until you’ve learned how to finesse the controls and master powersliding, you’ll have to come to grips with turns that are both slippery and unexpectedly wide. Though the controls could stand for some tightening overall, once the effort has been made even the trickiest of turns become second nature. Worth mentioning is that Super Circuit feels better than ever when played with a Pro Controller — there's little arguing that the game felt fine on an original model GBA (even on the SP), but having a full-sized controller to clench and dominate without carrying concerns of screen angles or backlighting makes a big difference. Single player is divided into three modes: Grand Prix, Time Attack, and Quick Run. Grand Prix is the meat of the package, offering five cups made of four race courses each. But it doesn't stop there. Not only can you burn rubber on 20 tracks unique to this game, but it's even possible to unlock every cup and course from Super Mario Kart. That makes for 40 courses in all, which is the most to ever come packed into any Mario Kart game. While some instalments in the series are notorious for too much balancing when it comes to AI, the gameplay here largely feels fair, and it's rare that a cheap shot will steal first place from you at the end of a flawless run. Don't get us wrong, 150cc can still present a very real challenge, but it's more common that your loss correlates with your performance as opposed to questionable occurrences. If the thought of opponents bumping into you and launching projectiles around sounds like the type of chaos you need to occasionally catch a breather from, Time Trial allows you to race solo and worry only about setting course records; Quick Run, on the other hand, is for players that want to deviate from the usual number of laps and customize the details surrounding their races. These modes don't do much to extend the value of Super Circuit, but they do serve as welcome alternatives to the usual Grand Prix action. Multiplayer would've made a nice addition alongside the other options, but unfortunately the effort wasn't put into figuring out how to get the System Link-only modes of the original game to function in split-screen, so don't expect to race off against friends. Sadly, lack of multiplayer isn’t the only area of Super Circuit that’s taken a hit from on the drive from GBA to Wii U. While there have been many GBA games that have transferred from the small screen to a television without a loss of visual purity (looking at you, Metroid Fusion), this is not one of them. 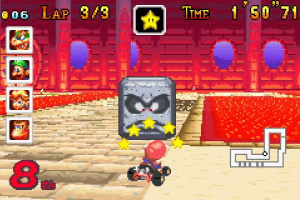 The racing antics look solid on the GamePad, but on a television the pixels are enlarged, and not only is there a serious lack of definition in the character models, but there’s even a weird effect on the environments where the track can sometimes appear to be shifting or shaking depending on the amount of detail present. It’s nothing that can’t be looked past if you’re determined to race, but it is noticeable and sometimes nauseating if fixated on. Courses are designed in simple fashion, without too many obstacles or moving pieces to dodge. What makes these locales memorable, however, are the diverse and imaginative themes and the striking colours used to bring them to life. Whether it's the golden mounds of cheese that make up Cheese Land or the mountains of presents serving as the backdrop to Ribbon Road, Super Circuit occasionally does its best Super Mario Bros. 2 impression by being weirder than its older brother. 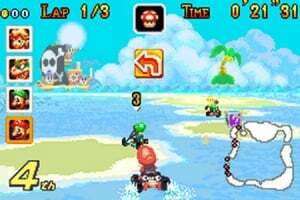 You can still expect the typical Mario raceways, those Bowser-y castles and beaches ripe with Cheep Cheeps, but the sense of variety is much broader this time around. What it comes down to is that this is a Mario Kart for fans of the SNES original, plain and simple. If that game was your cup of tea, you'd be silly not to test drive this one whether it be on GBA or Wii U. Thanks to the Pro Controller, this is the best-feeling version of the game, but because of the hit the visuals take when being presented on a large screen, it's not without detractors — an alternative is to focus on play off-TV with the GamePad, to reduce the impact. Thankfully, it doesn't hinder the gameplay, which is as fun and rewarding as it was when the game launched 13 years ago. While Super Circuit may feel better than ever with a Pro Controller in hand, it’s the visual presentation – which doesn’t translate well to a large screen – and the lack of multiplayer modes that keep this Wii U Virtual Console outing from being the definitive way to experience a GBA classic. Thankfully, the integrity of the gameplay is still intact, and those without the means of taking the original cartridge for a spin could likely race past the aforementioned shortcomings without too much concern. 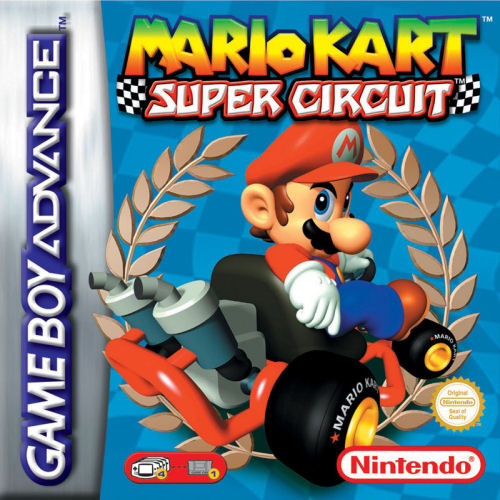 The fact is that this is a pretty great successor to Super Mario Kart, and if that's the game in the series that really revs your engine, you shouldn't miss Super Circuit. "So that means if you don’t regard the SNES classic very highly..."
...then this world clearly holds no pleasure for you. I almost feel like the score should be divided in half for not having multiplayer. It's missing half the game. Most of it, really. What fun is Mario Kart alone? I have this from the ambassador program. It's an alright game, the controls are much harder to get used to off the back of modern Mario Karts, but I wouldn't buy it again on Wii U. The lack of multiplayer really makes it pointless to own on a console. There's nothing the Wii U adds to this game to justify actually paying for it since it was free on 3DS. That and it hasn't been released yet. I had never played this game before, but Super Mario Kart is, after all these years, STILL my favorite game in the series, so I went ahead and bought this (before reading this review) because I thought it looked like an actual sequel to SMK. I'm so glad I did! It's exactly what I've been wanting all these years! More Mario Kart that feels like the original! It is pretty hard to look at on my huge TV, though, ha. But that's ok! I really enjoy this game, but I've already got it handheld. I'd love to have it on the Wii U, but 8 bucks with no multiplayer enabled is a bit high I think. Not sure why they don't just do something to give us multiplayer so we can have the full games. I used to play this all the time on my DS. I will buy tonight! 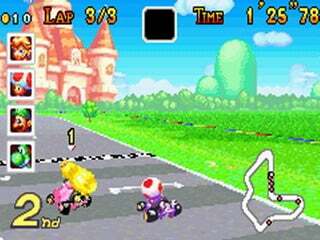 This is the best pre-Double Dash Mario Kart game. @Peach64 Going backwards? That's a terrible idea. The internet and Nintendo's investors would have a FIT. Personally, I feel this was a dumb idea though Nintendo probably saw it as a time to make a bunch of money because people would be on the Mario Kart hype due to the DLC. If this could be played multiplayer though, I would think it would be pretty nice. But without that... it is just disappointing. They should have at least included a way to play multiplayer locally. 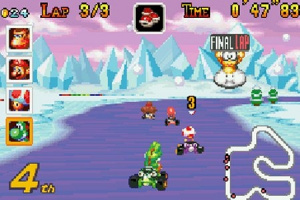 This was my favourite Mario Kart game after the N64 version. Whereas the N64 had superior multiplayer, MK on the GBA posed a great challenge alone as you had to finish each course with a certain amount of coins (as well as avoiding collisions and placing in first of course) in order to achieve the highest rank. I will probably stick to the 3DS version though as a lot of these titles were not intended to be blown up for use on 40" screens etc so I can see why Nintendolife are in favour of the smaller screen. I already have the original cart and have it for the Nintendo Ambassador 3DS thingy. Still need to get 3 stars on either version too.. only Mario Kart that I haven't done that with yet. Toughest Mario Kart to 3-star, surely. I dont remember this game looking like this on a 50" 1080p Panasonic Plasma with a GBA player for the Gamecube so i think that this might be an emulation issue. It is the MK I like less along with Super MK. The controls, the feel, the graphics... they aren't as I'd like. I enjoyed Super Mario Kart and enjoy Mario Kart 8. That is plenty enough Mario Kart for me but this is cool for those who cant get enough Mario Kart. That's why it would be great on the 3DS Virtual Console. Best 1p SMK game. Its faster than MK8 and it has 40 tracks. The controls are awesome and flexible. Its just people who have been spoiled by the newer MK games who have a restrictive but easy to learn controller. Tip if you wanna play this game. You must, MUST, learn to drift. You like, need to drift on almost every curve. Never liked Super Circuit. People say they get physically ill from Super Mario Kart, well it ain't got nothing on Super Circuit, which shoves ugly color palettes into the mix as well. Tracks are forgettable, the music's generic, and it fails to innovate much at all. Controls are even more sluggish and awkward than MK64. It just plain ain't my bag. I have tried this game many times seeing as I received it for free as an ambassador game for 3DS but I simply couldn't come to grips with the controls. Definitely controls alot different then the other Mario Karts! 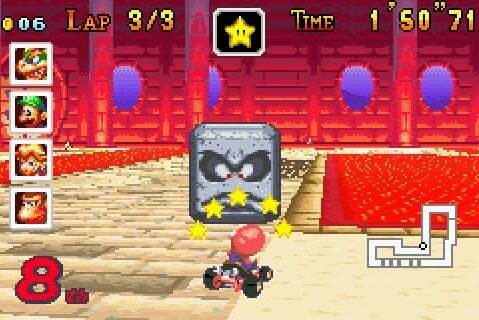 Still the only game with the red shell mine, by far my favorite Mario Kart item of all time. @Mr_G Nope. It plays beautifully on the Wii U tablet, just like Advance Wars. Apart from Sky Garden being the best and most amazingest song in Mario Kart history, I would probably agree. @Mr_G I don't get why people make such a big deal out of handheld games being released on home consoles. I think it's great being able to experience them on a big screen for a change. Also, they have a perfectly good reason for doing so. The games are apparently much easier to emulate on Wii U than they are on 3DS. I have this game as a 3DS Ambassador, and the turning is just way too sensitive. It sends me off the course almost every time I try to drift around a turn. I was only barely able to beat the second cup (and only after several tries) before I gave up on it. In short, it's by far the worst Mario Kart game I've ever played. To link 2 or more WiiUs locally. Or at least support 2 player locally, 1 player on the TV and the other on the Gamepad. @TulipWaltz I can foresee everyone complaining on early 2015 when Japan gets first the SNES and GBA catalog for the New 3DS. I think this game is only similar to the SNES game in terms of visuals. It plays and controls much more like the N64 version than anything else. Also, this is my favourite Mario kart by a country mile, partly because it's so damned hard. I've pumped sooooo many hours into this game.